We live in a split-level home. You’ve seen most of the main level (the foyer, kitchen, dining room, and living room). Bedrooms and a couple of bathrooms are upstairs. Downstairs, there is the den, an office, a utility room, and a bathroom. While the main level of the house is now very updated, the downstairs is the complete opposite. With apologies for the very poor lighting and quality of the iPhone photos, here is the half bath. We want to replace everything about this room in the future. However, having the hideous drop ceilings now mean when we renovate the two bathrooms upstairs we can have easier access to the plumbing. 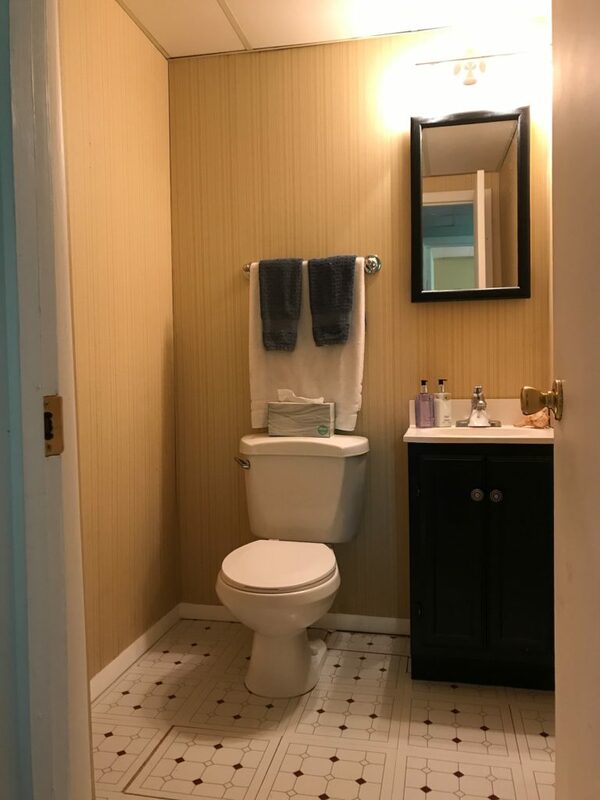 Plus, this bathroom gets the least use and is actually on the bottom of the list for bathroom renovations. I always forget there is a medicine cabinet down here. It has obviously seen better days. In my opinion, medicine cabinets aren’t given their fair shake. 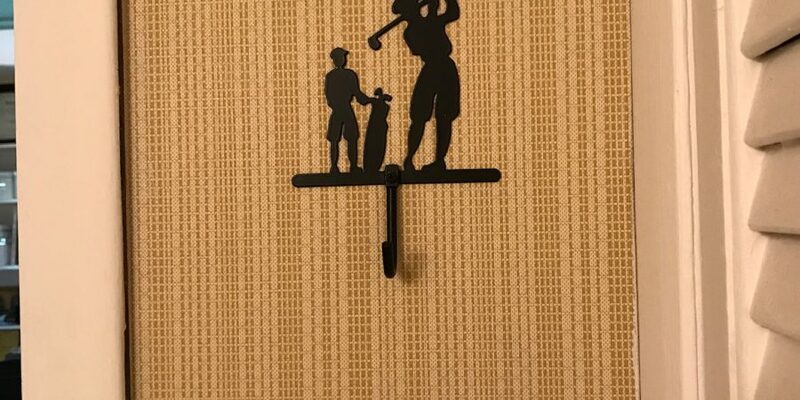 They are actually clever designs! It is much preferable to store items at eye level rather than below. 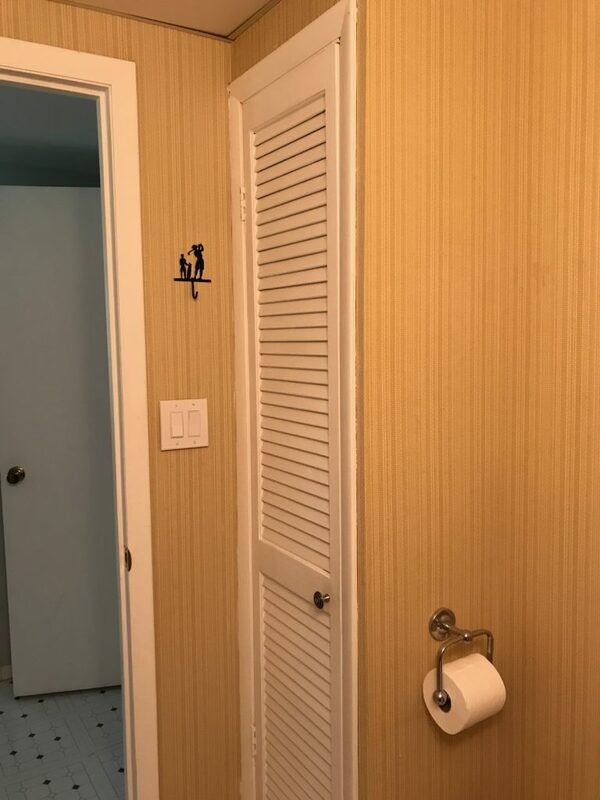 However, there is just no need in this bathroom. 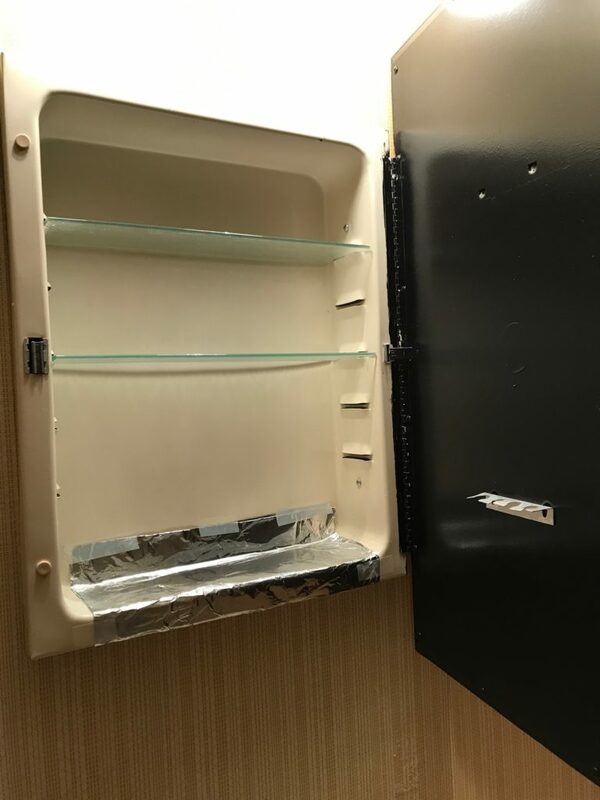 What would we possibly store in a medicine cabinet down here? Similarly, underneath the diminutive sink cabinet we aren’t keeping very much. 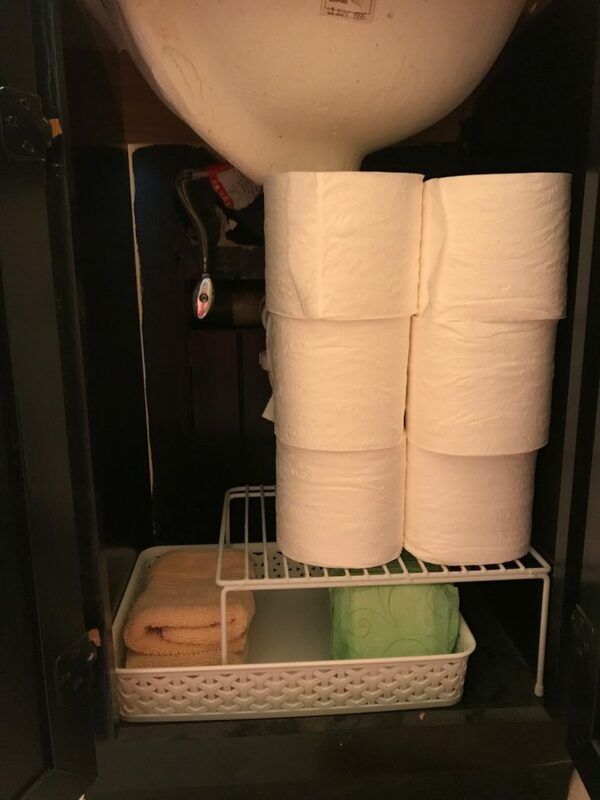 I have never lived in a place with so much storage that toilet paper could stay anywhere else besides the bathrooms. Honestly, if I keep much more than that in here, I forget about it. 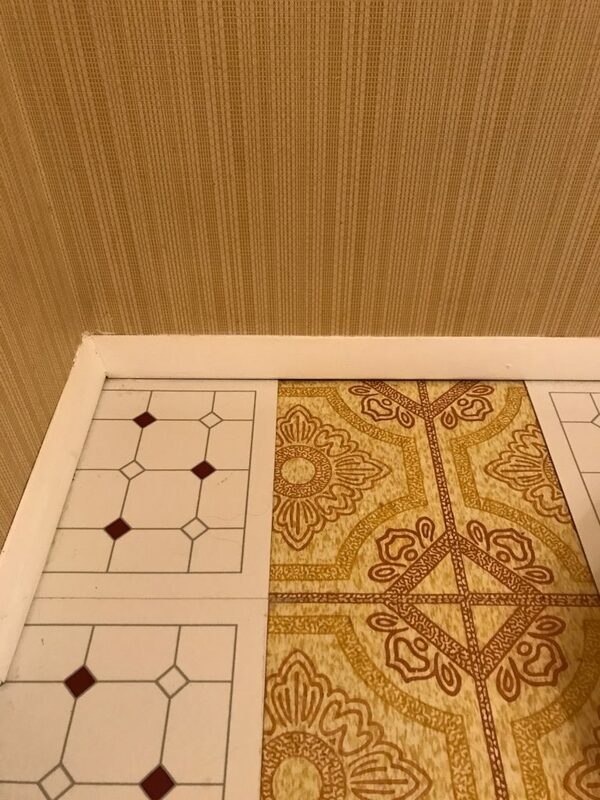 There is cheap peel-and-stick tile in this bathroom and the hallway leading to it. Underneath is some pretty groovy linoleum. We actually took up the sticky tiles for a few weeks to see if we could live with the retro look…and they smelled horrible! It is the weirdest thing! I don’t know if someone was a smoker a long time ago, but the original tiles reek. 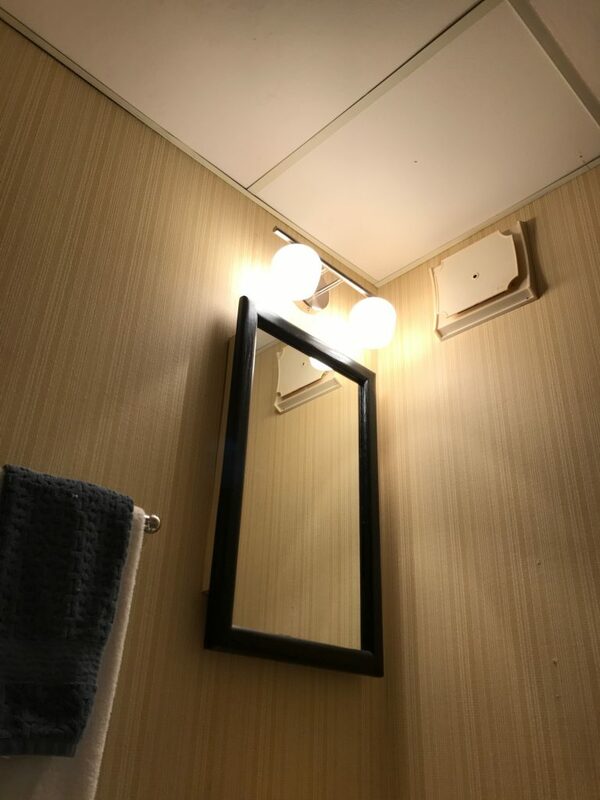 So the [now only semi-] sticky tiles went back on. One of the coolest things about this house is the laundry chute. There really isn’t space for a hamper in the bedrooms, so having one communal chute is really convenient! Bradley helps put dirty clothes (and also toys, shoes, remotes, etc) in there. The one big bummer is that it doesn’t actually lead to the laundry room. 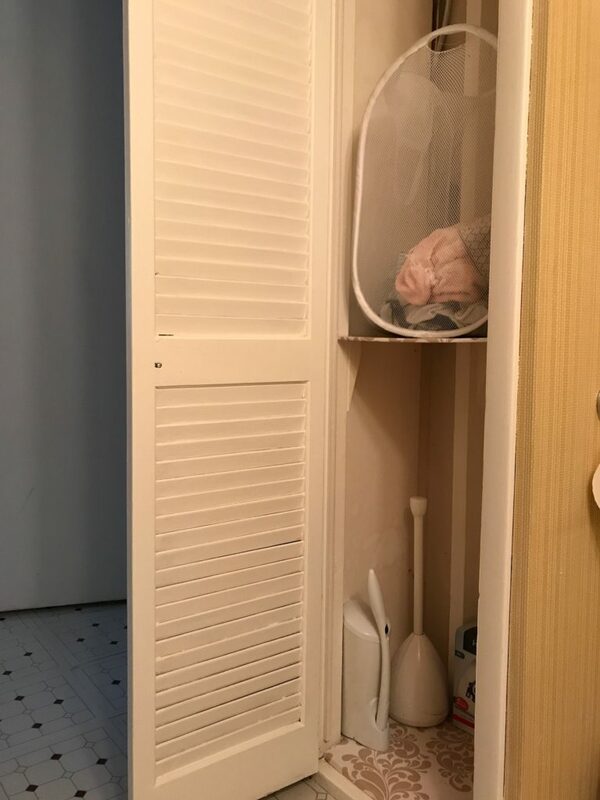 I still have to gather the laundry from this bathroom and then take it to the basement. The bottom half of this closet is currently under-utilized, but I’m not sure how to best maximize it either. 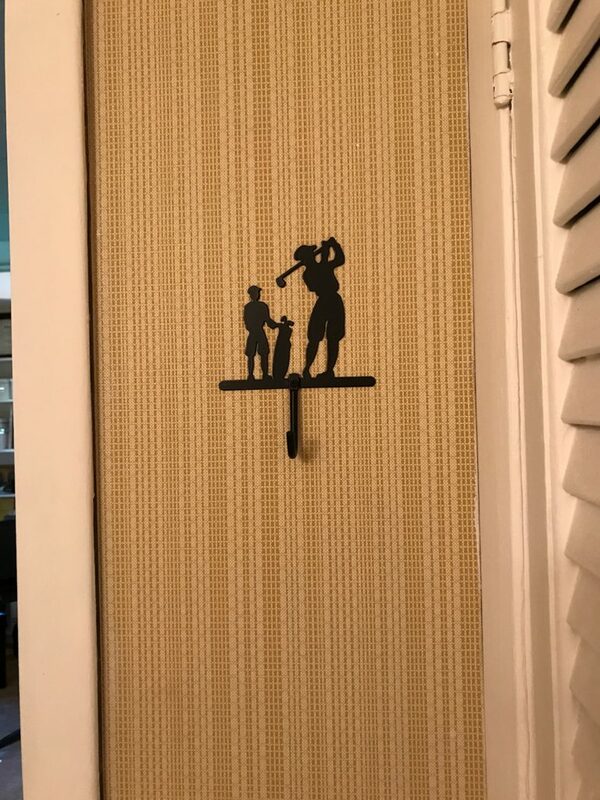 The previous owners left us this gem of a wall hook. 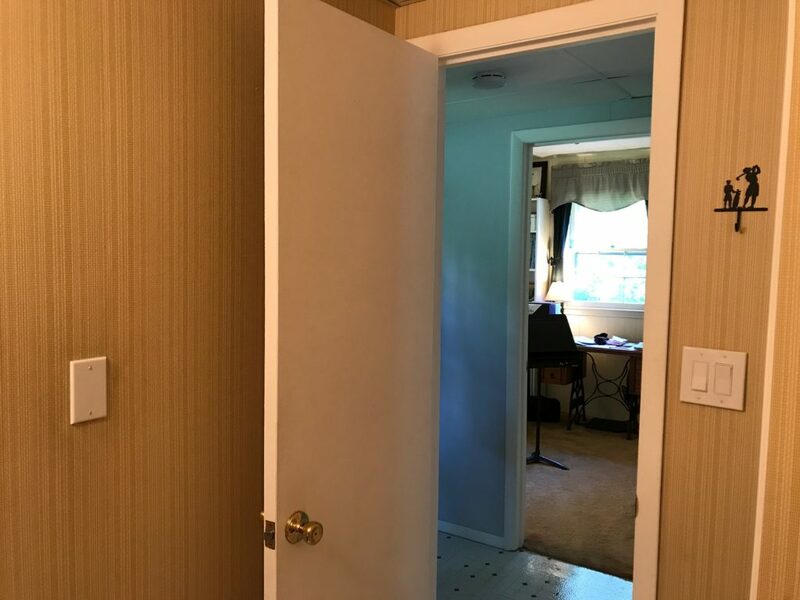 Oh and another one of the first projects Pat did in this house was move the light switch from the spot on the left to where it currently is beside the door. This house definitely has its quirks. We’ve come a long way with the renovations on the main level, but there are some things to tackle down here for sure!